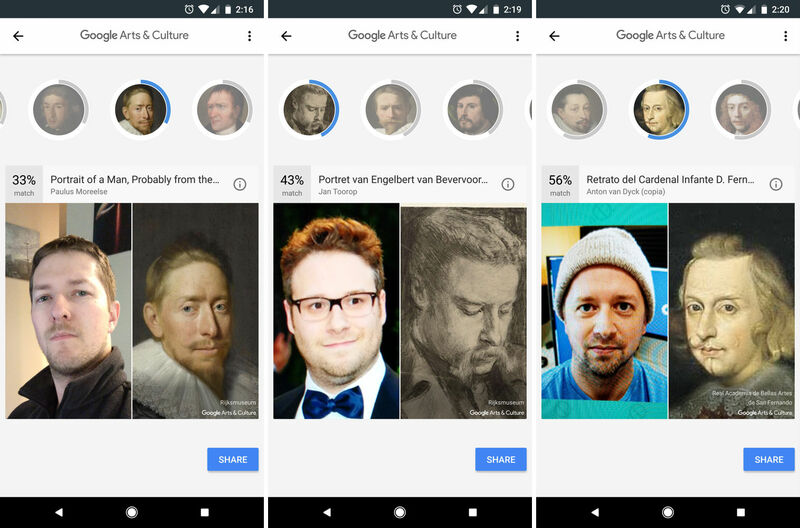 If you’ve been on social media recently, maybe you’ve seen this bit going around where people use a selfie of themselves in the Google Arts & Culture app, which is then cross referenced with paintings inside of museums around the world. It’s pretty funny, and even though I apparently look like no one who has ever been painted (maybe that’s for the best), it’s still a lot of fun to try. All you need to get started is the Arts & Culture app from Google Play, linked below, then scroll down until you see the new experiment where it asks, “Is your portrait in a museum?” The picture you use will be referenced against thousands of paintings, and from what I can tell, how you position yourself in the selfie doesn’t quite play as big of a role as you may think. For my photos, I was trying smiles, no smiles, a tilted head, and all sorts of things. However, even with all those moves, I continued to get similar results. As is shown when the app is doing its processing, it’s basically using measurements on your face (which shouldn’t change regardless of how you hold your head), then using those numbers against its library of paintings. Either way, the results can be quite comical and revealing, so go have some fun. Go download the app and try it yourself. If you get a really good match percentage, feel free to share it with us down below. We’re dying to see what you get.